Julie Rose Sews: What do we want? A BLOG POST!!!!! When do we want it? What do we want? A BLOG POST!!!!! When do we want it? For my birthday, my parents got me lots of lovely things, including fabric, yarn, ballet flats, and two books, both by Ana Paula Rimoli: Amigurumi World: Super Cute Crochet and Amigurumi Two! 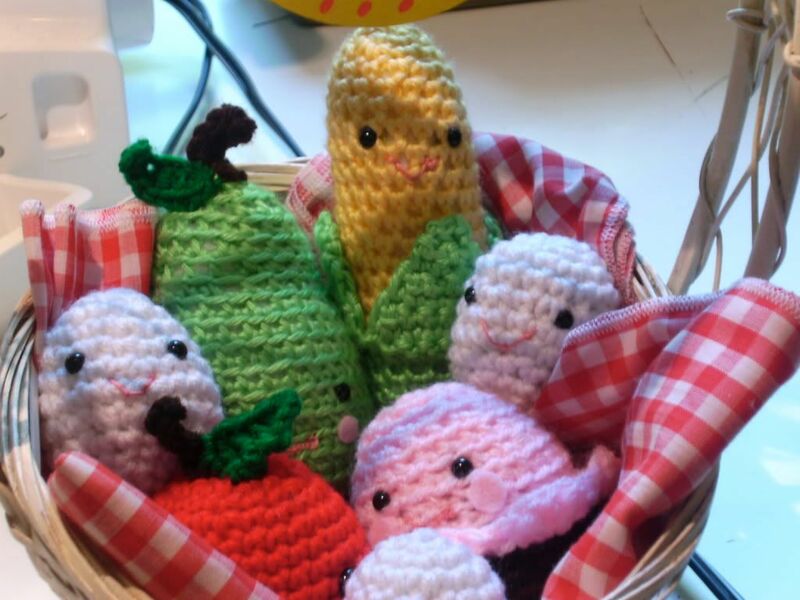 : Crocheted Toys for Me and You and Baby Too. They are full of the cutest little creatures imaginable. 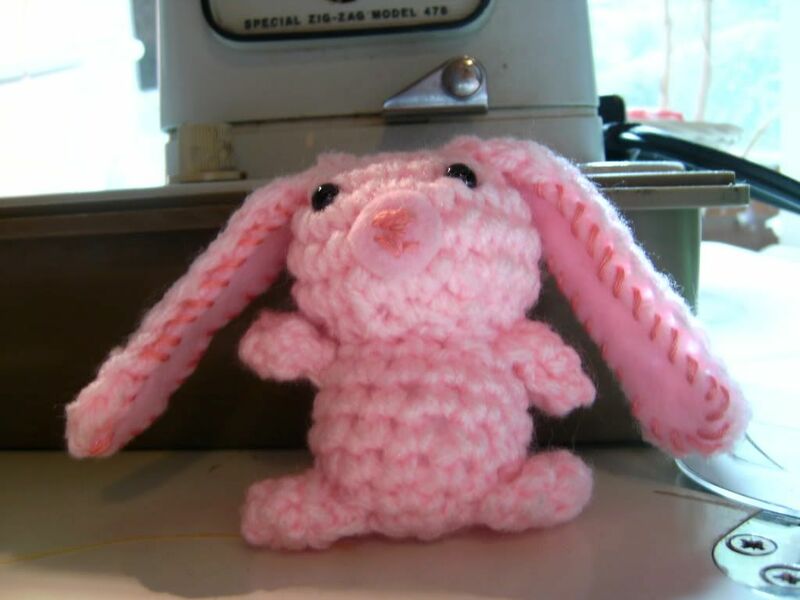 One of my favorites is the 'Tiny Ami Bunny,' which I made in pink! I also made lots of little foods, which went to the girl I babysit for her birthday, complete with a picnic blanket and basket. The egg patterns are from Amigurumi World by Ana Paula Rimoli, The apple and corn are free patterns from Lionbrand.com, the pear is from here, and the cupcake is from here. In other news, the garden is producing massive amounts of berries! There are wild blueberries growing up in out field, and inside the garden are black raspberries, red raspberries, and my favorite summer treat, golden raspberries. Mmmmmm. Bishop Allen: "Click, Click, Click, Click" and "Choose Again"
The Killers: "Losing Touch," "I Can't Stay," and "Human"
Paul and Storm: "Other Places Jimmy Hoffa Isn't"
You know what I wish was sold? Extra tops for perfume bottles. I lose them constantly and then I can't take my perfume anywhere. Speaking of perfume, I finally found one that I like almost as much as the Escada Moon Sparkle that's no longer being made. When Marissa came up to visit me, she sprayed a perfume and I thought I was going to die, it smelled so good. Naturally, I had to have it, and asked her what it was. It was..... *drumroll....* Love Spell, from Victoria's Secret. It has a sort of peachy top-note, and it mellows into a warm berry-vanilla smell. Yum. It does fade fairly quickly, since it's a body spray and not an eau de toilette, but at $9, you can afford to spray twice a day. Love Spell Body Mist, $9, at Victoria's Secret stores or at victoriassecret.com. I'm going to Marissa's house for a few days, and we will be going to Knoebel's amusement park. There is no knowing what kind of mischief we will get into. I am not normally one to talk about how much I like a particular commercial, but I've been watching full episodes of shows on hgtv.com recently, and I really, really like the Blackberry commercial with U2. They managed to capture the energy of a concert really well. I mean, I would be pretty enthused if I got to be in the crowd for the filming of that, too. But... I just think it's a really well done commerical. I like it a lot. 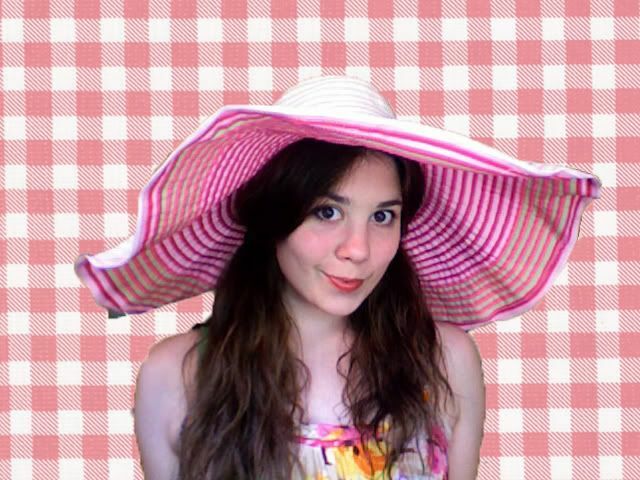 I am now the proud wearer of the biggest hat in the world. It was a birthday present from my aunt and uncle, and I love it! It makes me feel like Strawberry Shortcake. It's from the Scala hat company. It's also offered in lots of other colors, for those who don't wish to be seen from space while sunbathing. 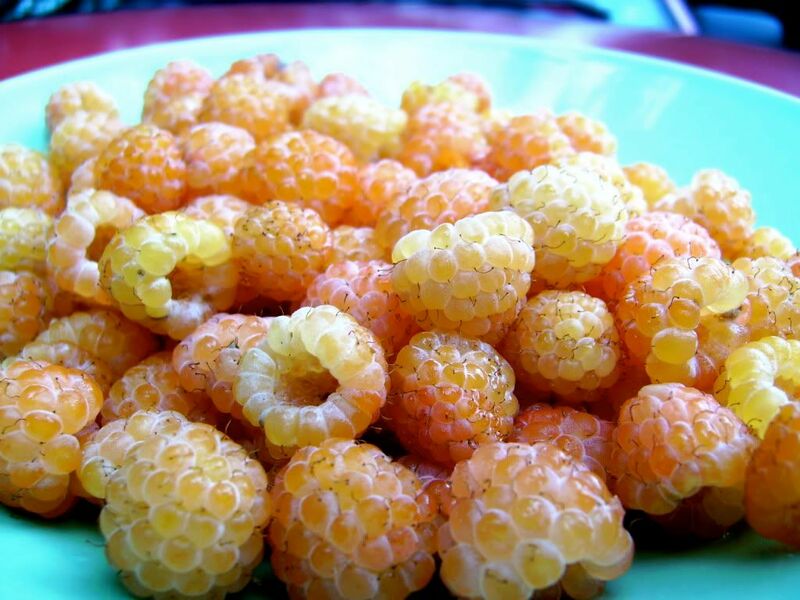 I didn't know that there were golden raspberries...They look pretty tasty! I really like how you stuff a lot of content into your blog posts. Well, part of it might be because it's been a year since your last update, but it's neat to see so much stuff! And that U2 commercial just came on while I was typing this! Talk about crazy lighting effects! i just got "click click click click" out of my head, and now it's back...oh well!